I hope everyone had a delicious Thanksgiving holiday. Personally, I’m still feeling the ill effects of a plate piled so high it took me four separate attempts to finish. I’m finding gravy in places that gravy should never be found. Needless to say, it’ll be all salads for me these next few weeks, that is, until my mother-in-law prepares her famous roast beef + Yorkshire pudding for Christmas (gimme gimme). But not to worry, as it gives me the perfect opportunity to share one of my favorite recipes from the new Rich Table cookbook. Yes, that Rich Table; Sarah and Evan Rich’s Michelin-starred SF gem. 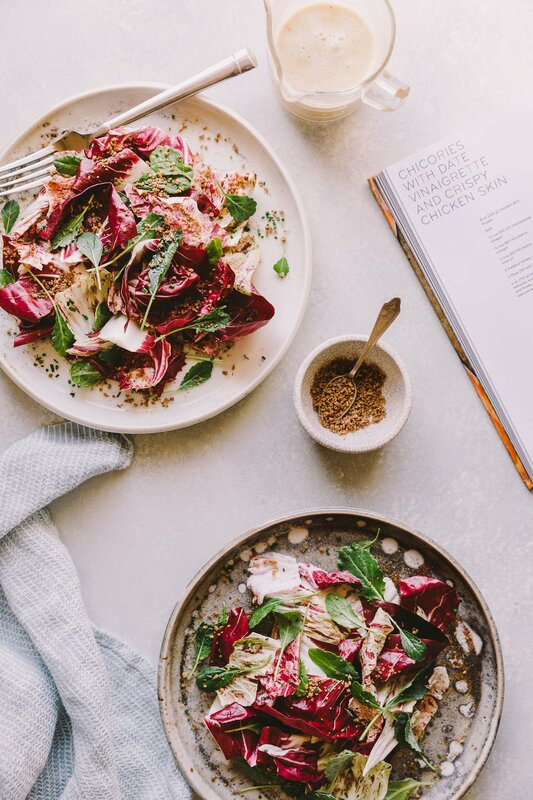 This chicory salad with baby kale and date vinaigrette had me swooning the moment I saw it in the book. I’ve made it about a dozen times since, and I don’t think I’ll be stopping anytime soon. Oh, and did I mention it’s topped with crispy, crumbly, salty chicken skin bits?!! 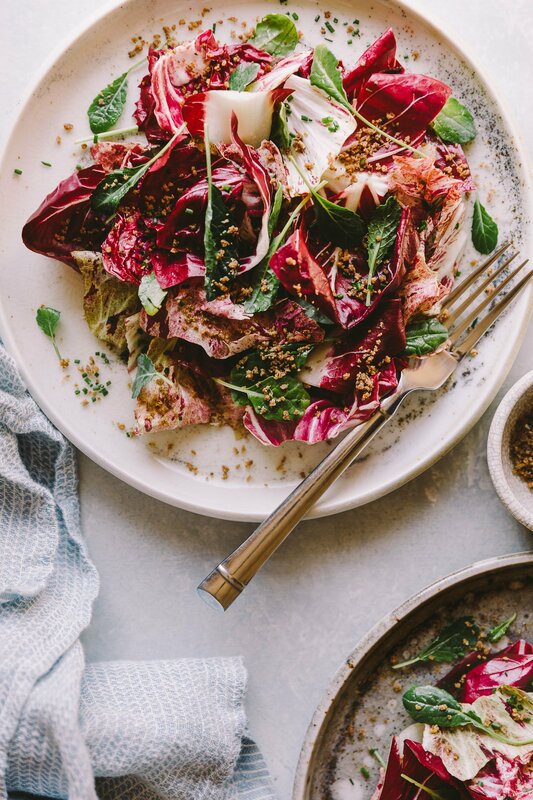 Don’t judge me 😛 I highly advise you do yourself a favor, grab some bitter greens and give this salad a go. Especially now that we’re all taking a break from romaine at the moment. Chicken skin can be tricky to find, but your local butcher should have some tucked away in the freezer. And if not, you should be able to request that they set some aside for you if you call in advance. A half pound should only set you back a dollar or two. 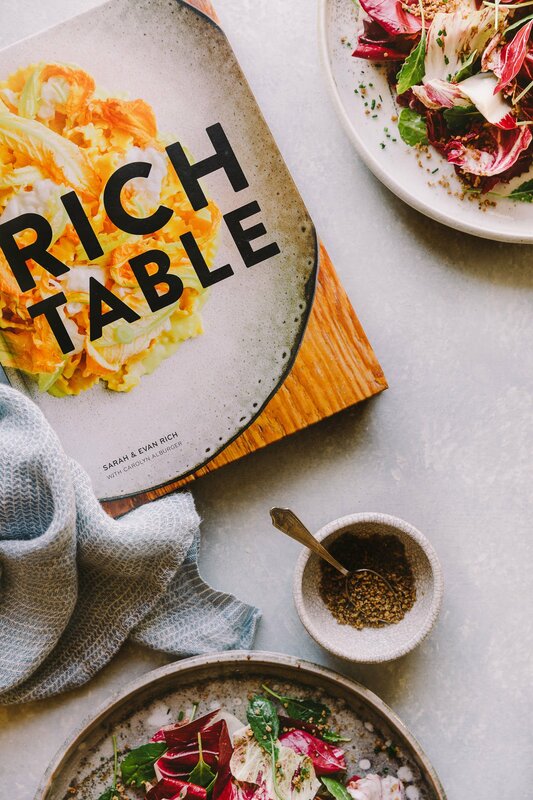 And while you’re at it, you might as well grab a copy of the Rich Table book for yourself, or even a friend/loved one for the holidays! It contains their infamous porcini beignets . . . I know what I’ll be making next! 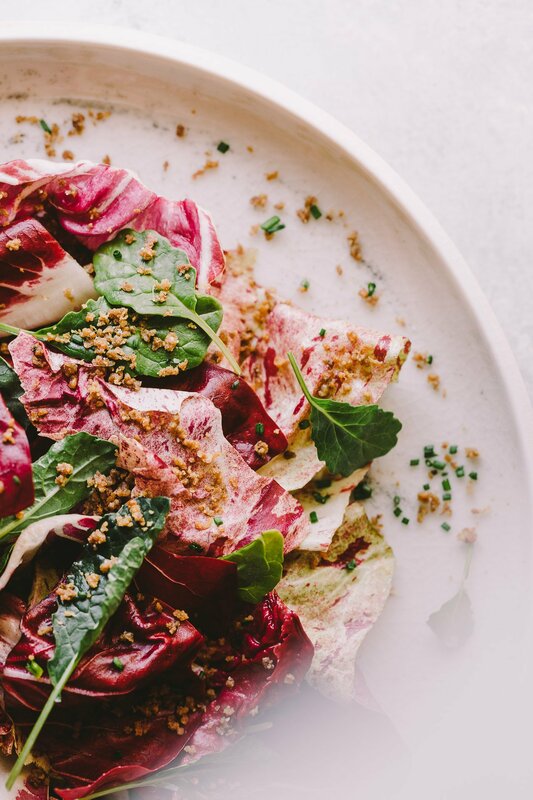 From the pages of the delectable Rich Table cookbook comes this robust chicory salad with baby kale and luscious date vinaigrette, all topped with crispy, crumbly, salty chicken skin bits. Using a meat grinder or food processor, grind the frozen chicken skin into small pieces. Transfer the skin into a small skillet and cook over medium heat until crisp, about 15-20 mins. Using a slotted spoon, transfer the chicken skin to a paper towel-lined plate. Season with salt and let cool to room temperature. In a blender combine the vinegars, olive oil, dates and water. Blend until smooth (about 30 seconds) and season with salt. 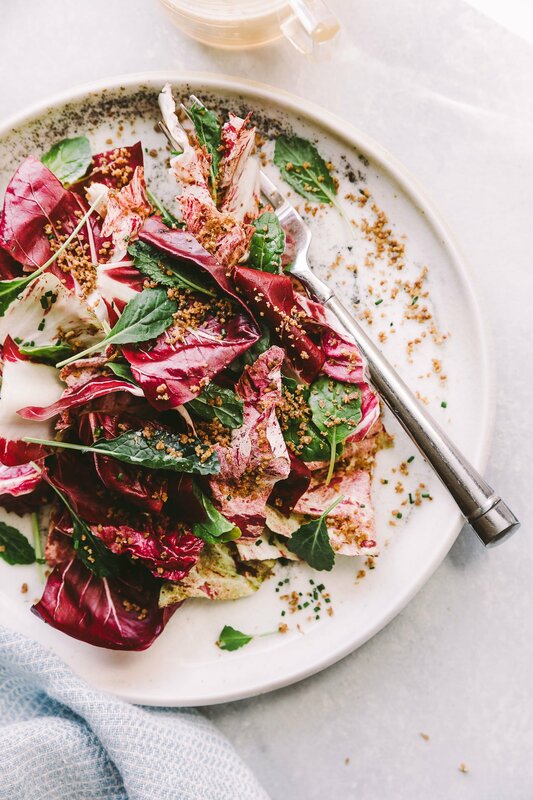 Tear the lettuces into bite sized pieces and place in a large bowl and toss with 2 tablespoons of the date vinaigrette. 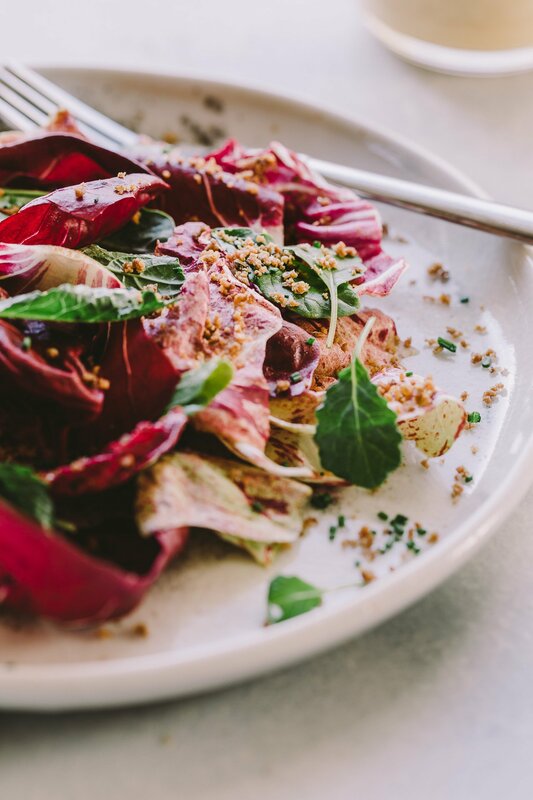 Add additional vinaigrette to taste. Divide the dressed chicories between two serving plates and top with a generous amount of chicken skin. Serve immediately.